i agree with balut's comment above. hehe! ganyan din yung ex ko. 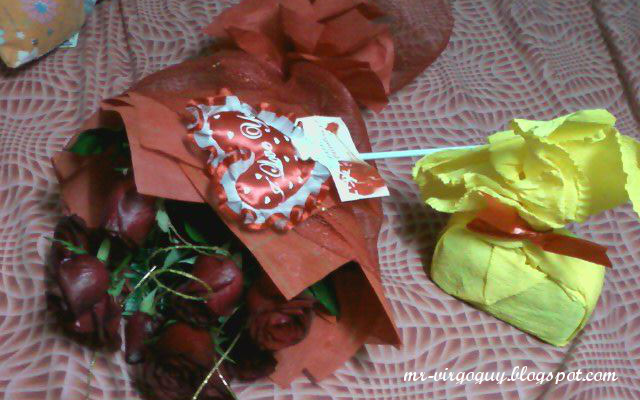 nagpadeliver ng flowers sa'kin the day or two after ata ng Valentine's. sabi ng delivery guy sa'kin pag receive ko nung bulaklak, "Uh-oh, somebody's going to be in trouble." LOL. Ganon ate KM? Nagpasalamat naman siya sa akin at happy siya. Eh ikaw ba nagalit? Sweet :) she must be very lucky and you must be very in love with her. How i wish my boyfriend will do the same for me. I wish my boyfriend will be very proud to share the world how that he loves me (and only me).